Yes, ballooning has an amazing safety record! It is one of the safest forms of aviation there is. Like any adventure or aviation activity there is some risk involved. Ballooning mishaps, while extremely rare, still do occur. The most common mishap is a rough landing due to unexpected winds. The most dangerous is a powerline strike. Our pilot and crew are trained to minimize these risk factors and to make your balloon ride as safe, fun and amazing as possible. The amazing rewards of experiencing a flight in a hot air balloon far outweighs the minimal risks. 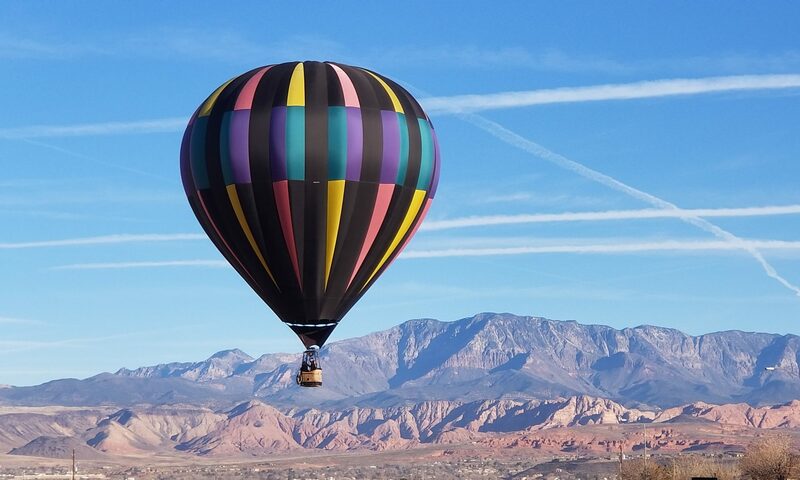 Do you need to be licensed to fly a hot air balloon? Yes. To fly a hot air balloon you need to have flight and classroom instruction, take a written test and take a flight test with an FAA examiner. To fly passengers for hire a pilot needs to take additional, more intensive training to get their commercial certificate. How many hot air balloons are there in the United States? There are only roughly 3000 balloons registered in the United States, with between 5000 to 6000 hot air balloon certificated pilots. However, not all of those pilots actively fly. Science! As magical as balloon flight seems there is actual science behind what makes our balloon lighter than air. We use a heater system, called a burner, that takes vaporized propane and burns it producing a huge, hot flame! Our burner output is around 9 million BTUs, in contrast the average heater in a home is around 90,000 BTUs. The air is heated inside the envelope which causes the air to be less dense than the air outside of the envelope. And as we all remember from science class, less dense, hot air rises! The balloon envelope is the container which holds in this hot air. So to rise we heat the air more, to descend we let the air in the envelope cool or we can open a vent on the top of the balloon to allow some of the hot air to escape, causing us to descend faster than if we let it cool on its own. Can you steer a hot air balloon? No, not in a conventional way. Unlike other aircraft or cars balloons have no direct means to control their horizontal movement. However, balloon pilots can control the vertical movement of the balloon within inches! Balloon pilots use this fine amount of vertical control to climb or descend into different winds at different altitudes. Sometimes the wind at 500 feet is the complete opposite direction of the wind at 1000 feet! Pilots use their knowledge of the local wind patterns and winds aloft forecasts to roughly plan their flight path. By no means is this precise as we never know exactly what the winds will be at a given altitude, which is all part of the fun and adventure of ballooning! What does it feel like to ride in a hot air balloon? Our pilot, Mike, has hundreds of hours of flying time in all kinds of different aircraft. Commercial jets, small aerobatic planes, ultralights, warbirds, helicopters and even a zeppelin airship. Yet he always says nothing he has ever flown compares to the experience of the hot air balloon. Flying in a balloon is the feeling of pure freedom, gently drifting along with the air currents. The unobstructed panoramic views are like none other. It is peaceful, quiet and calm, yet adventurous, exciting and exhilarating! How high do hot air balloons fly? The world record for a hot air balloon is 69,000 feet!!! However, we fly at much lower altitudes. The joy of ballooning comes from flying low over the terrain! We normally fly from inches off the ground to 1000 feet above the ground, although the majority of our flying is under 500 feet up! Without accurate directional control we never are 100% sure where we will land. That is part of the adventure of ballooning! We plan on some landing areas based on winds and launch location, but it is never a sure thing to land in a certain spot! We land in parks, backyards, fields parking lots and even cul-de-sacs! An important part of ballooning is establishing long lasting relationships with area landowners so that we can use their land as a landing site! Without the generosity of landowners letting us land on their property ballooning would be in trouble. Is it considered an actual aircraft? Yes. Our balloon is an FAA certified and registered aircraft. We are required to maintain the balloon to manufacturer specifications and we must take the balloon to a repair station every year or 100 hours of flight time (whichever comes first) where it undergoes a in-depth inspection. What is the balloon made from? Our balloon has a basket that is made of Rattan wicker and wood. Wicker is strong, yet flexible and has been used for many, many years in hot air balloon baskets because of its lifespan, ease of care, strength and flexibility! The envelope (the “balloon” part) is made of a rip-stop polyester fabric that is coated with a special coating to extend its lifespan. What does it use for fuel? We use propane for fuel. Literally the same propane that you use in your grill!